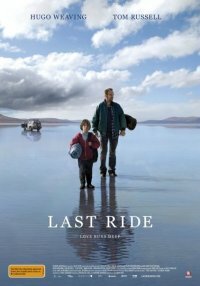 We've been follow the new wave of genre film coming out of Australia very closely, and one on the top of our lists is the Hugo Weaving starrer Last Ride we first reported on back in February. The basics of the story is that Hugo, presumably a criminal, takes his son on the run in the outback after some type of crime which I'm guessing is murder. A desperate father takes his ten year old son, Chook, on the run after committing a violent crime. As the two journey into the desert and an unknown future, their troubled relationship and the need to survive sees them battling the elements and each other. Chook eventually takes control and the choice he is forced to make has a devastating effect on both their lives. And it looks mighty fine. Trailer after the break. The glorious return of the father figure. Looking liek it could be worth viewing.I'm not too used to Aussie films, so I'm interested. Hugo looks just as perfectly cast in this as he was as Elrond in the lotr trilogy.